001_6400, originally uploaded by infrar3d. 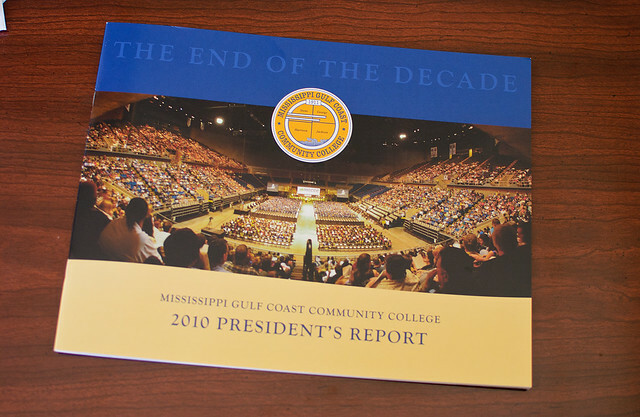 The panorama I took at last year's record-setting graduation was used for the cover the 2010 President's Report, which I guess is the higher education version of an annual report. I just got my copy today. It's nicely printed, by Hederman Brothers I think, and Mike gave it a classy design. This was made with three images, stitched together in Adobe Photoshop CS4 . Probably two would have been enough, but I gave them a lot of overlap. If these had been shot in NEF/RAW I might have been able to pull something out of those blown highlights in the floor, but we always shoot JPG at these events for the fast turn around. Here's a link to the image itself. The technical details/affiliate links: Nikon D700 , Tokina AF 17mm f/3.5 (I use the original, non AT-X version, and I don't think Tokina sells either version currently), Slik U212D tripod , and a Yongnuo RS-N1 wired shutter release (which Amazon doesn't carry). When I finally took the time to look inside the President's Report, I realized I had a couple more shots published in the interior. 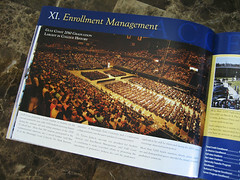 The first one is taken from the opposite end of the coliseum compared to the panorama cover shot. Also taken with the Tokina 17mm. Over 900 students and their families in this shot. 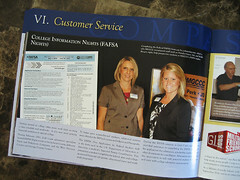 There were over 1600 graduates total. The second interior shot was taken the same night as the other two, outside the main arena. Obviously not with the 17mm, but I can't remember what lens was used. I know I used the Ray Flash. I always use a ring flash at events like this, where you've got about 30 seconds to ask a stranger to mug for the camera. You spend more time filling out model releases than taking shots, and the Ray Flash adds a little something to the shot without using any extra time.